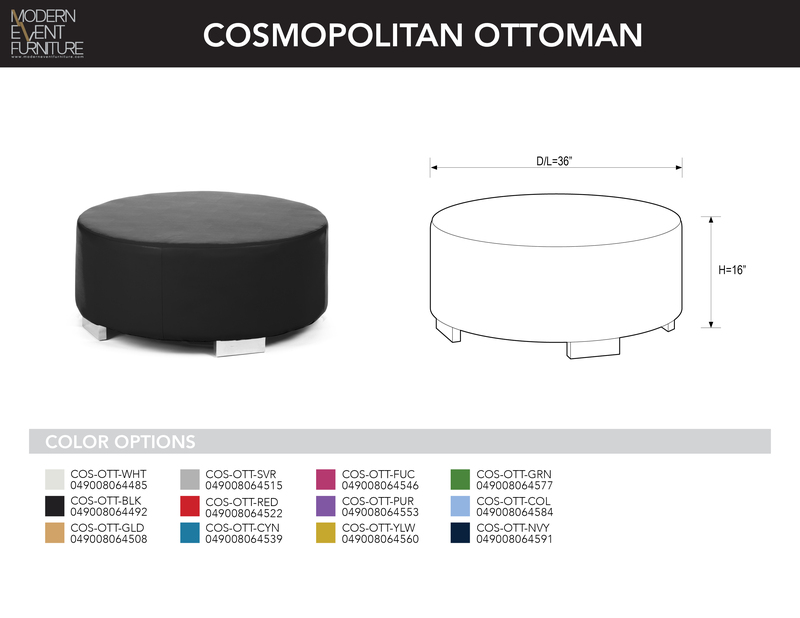 Cosmopolitan Skin - MEF Modern Event Furniture Inc. SKIN USED TO RECOVER A COSMOPOLITAN OTTOMAN. THE MONDRIAN COLLECTION HAS BEEN OUR STAPLE SINCE 2004. THIS MODULAR SYSTEM WAS DESIGNED FOR RENTAL; EACH ITEM IS LIGHTWEIGHT YET DURABLE, SIZED FOR A STANDARD DOORWAY, AND EASILY RECOVERED BY YOUR STAFF WITH OUR PRE-SEWN SKINS, REQUIRING NO PREVIOUS UPHOLSTERY EXPERIENCE. OUR CUSTOM STAINLESS FEET ARE VIRTUALLY INDESTRUCTIBLE, THIS COLLECTION WILL BE YOUR MODERN WORKHORSE. THE PIECES ARE DESIGNED ON THE SAME SPECIFICATIONS TO FIT TOGETHER IN COUNTLESS WAYS LIMITED ONLY BY YOUR IMAGINATION.